If you are suffering from diabetes, you should be very careful about the food you eat. Recently people are crazy about eating packaged foods, which offer high nutrition and vitamins and are devoid of calories. One of the best breakfast options is cornflakes. In most of the households cornflakes form the breakfast for the whole family. This is easy to prepare and do not consume any time. But it may not suit all people. Have you wondered whether cornflakes are good for diabetics? Does it help in the treatment of diabetes? Diabetes is a lifestyle disease. Here the blood sugar increases uncontrollably. So, many people think that if they start their day with a bowl of cornflakes, they can control diabetes and remain healthy. But this can aggravate not only diabetes, but also the risk of many other lifestyle diseases. A healthy breakfast should contain foods that are low in sugar, fat and calories, but high in nutrients and fibre. Choosing the right diet is very important for keeping the blood sugar levels within normal range, especially if you are a diabetic patient. 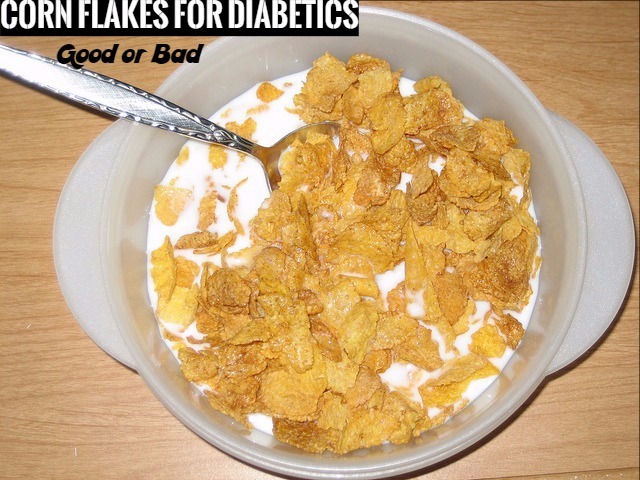 So, cornflakes with milk are not a good option for diabetic patients. This can increase your risk of suffering from diabetes. Are cornflakes healthy for you? Breakfast is important and you should never skip it. It provides you the energy that you require to carry out various activities throughout the day. Mornings are always tough and hectic. So, many households opt for instant breakfast. However, choosing cornflakes and milk as a healthy breakfast is not a good choice. This is because cornflakes are not very healthy for you. Cornflakes are made of corn, sugar, malt flavouring and high fructose corn syrup. Most of the brands that sell cornflakes in the market have high glycemic index (GI). This can increase the risk of diabetes. You should know about Glycemic Index to understand the negative effect of cornflakes on diabetes. The GI is used to measure how a food rich in carbohydrates can increase the level of glucose in the blood. This means that foods high in GI can raise the levels of glucose in the blood more than the foods having low or medium GI. This means that diabetic patients should consume foods that have low or medium GI and plan their meals accordingly. In case you have had a high GI food in your meal in the morning, you need to balance it by eating low GI food in the evening. As mentioned earlier, cornflakes are rich in carbohydrates. So, they have high GI. This means that cornflakes are not suitable for people suffering from diabetes. Cornflakes help in making your stomach full when you have it, but it is low in protein and makes you feel hungry after a few hours. Although it is low in fat, the high sugar content in it makes your body store fat. You will notice that most of the cornflakes brands you get in the market promote the product to be ideal for losing weight. However, this can work only if you take it in smaller portions. If you have it in high amounts, it can make you gain weight rather than lose weight. Eating cornflakes in large amounts also increases the sugar levels in your body. People often add sugar or honey to the cereal to enhance the taste. This can increase the sugar in it. This is sure to increase your chances of gaining weight within a short time. It is true that cells need glucose to survive. But too much consumptions of glucose increase the GI. This can lead to various health problems in diabetic patients. Diabetic patients are advised to avoid foods with high GI in their diet. Make sure that you include foods with low GI, like legumes, non-starchy vegetables, dried beans, some starchy vegetables like sweet potatoes and fruits, and cereals in your daily diet. You can also include meat and fats in your meal, as they do not contain carbohydrates. So, Is cornflakes good for diabetics? According to American heart association, the sugars added to cornflakes contribute absolutely no nutrients and empty calories, leading to obesity, reducing heart health and increasing GI. Processed foods contain high amounts of sugar. So, these foods are also included in high GI category. Cornflakes are also a type of processed foods. It has high sugar content and a high GI of 82. This can increase the levels of blood sugar in the body instantly, thereby increasing the risk of type 2 diabetes. When there is an increase in the levels of blood sugar, they create a need for insulin. This can make your body vulnerable to type 2 diabetes. Cornflakes are low in fibre. Fibre is essential for controlling the blood sugar levels and can even control the risk of heart problems. The reason for low fibre content in cornflakes is because of the refinement process that the corn undergoes when it is processed. Cornflakes are also sources of sodium. According to studies made, one cup of cornflakes contain more sodium than a pack of potato chips. This means that cornflakes can increase the risk of high blood pressure, thereby making you prone top heart diseases. So, you can see that although cornflakes are not that unhealthy, they can increase certain health conditions like diabetes and heart problems. So, you should avoid having them regularly for your breakfast. I didn’t knew why corn flakes is not good but after reading this i got to know the reasons why it is not good. Thanks for sharing this. thanks for sharing this information as I just bought econopack of Necstle Cornflakes believing it is helpful diet for having type 2 diabetes. now I know that is still dangerous to eat them. I will just share the cornflakes to my sister who is not known yet with this lifestyle disease.